Comilla Victoria Govt. 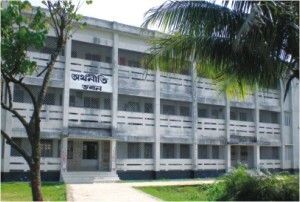 College is one of the oldest colleges in Comilla as well as Chittagong division. It is the pride of the people of Comilla. Landlord of that time Roy Bahadur Anandra Chandra Roy had established the college on 24 September,1899. Anandra Chandra Roy was a renowned patron of promoting and developing education in the district. He was a contractor by profession and accordingly set aside a large amount of money to establish a college for the development of higher education in Comilla. Comilla Victoria College was thus born to fulfill his long cherished dream. In recognition of his noble endeavour th British Govt. awarded him the title “Roy Bahadur” after the establishment of the college. A white color sculpture was built in front of the main gate of intermediate section of the college to keep the memory of Roy Bahadur alive. “Sattendranath Boshu” was the first principal of the college. He was the headmaster of former Comilla Victoria School. He remained the principal of the college till his death. He was a scholar as well as a researcher of literature. He was also a professor of English and was awarded Rabindranath Prize for his outstanding contribution to literature. Comilla Victoria College started its journey with only 107 students and 7 teachers. There was only intermediate section at the time of beginning of the college and later honours section was started in 1918. 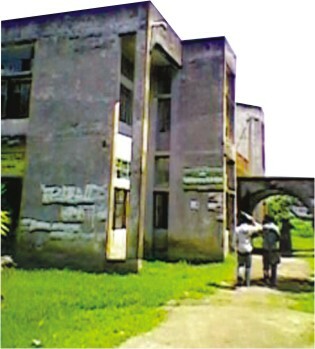 There was only one classroom and an administrative building at the initial stage of the college. BSC Course and BCOM Course commenced in 1942 and 1956 respectively. The college started its night Shift program from 1958. Intermediate section and honours section were divided in 1962.The college was nationalized in 1968. Five more new departments were initiated in 1971 while Bengali and Economics courses commenced in 1973. ICMA program was started from 1982. It gained the dignity of an University College during 1984-1985. More nine departments were included in 1996. All the principals of Victoria College played a great role for the development of the institute. In this regard the name of Akter Hamid Khan is worth mentioning, who was also the founder of Comilla BARD ( Bangladesh Academy For Rural Development). The numbers of students of this college increased rapidly during his period. Victoria College is located on 29 acres of land including its intermediate and honours section. At present there are about 2,400 students in intermediate section and 12,500 students in honors section. There are 129 teachers in this college against 150 posts. But this small number of teachers is not sufficient address such a huge number of students. Moreover teachers are to take classes in both intermediate section and honours section. So the authorities urged the Govt. to recruit more teachers for the betterment of the college. The total number of departments of the college stands at 18. The name of the departments are Accounting and Management department of Business faculty, Physics, Chemistry ,Biology, Zoology, Botany, Mathematics, Statistics of science faculty and English, Social Science ,Social Welfare, History, Islamic History, Political Science, Economics, Philosophy and Arabic of arts faculty. The academic result of the college is something college authorities always take pride of. The college always stands first in Comilla Board on the basis of good result in HSC. Meritorious students try to get admission in this college because of its name and fame. Students of the Honours section also do very good in examinations. Most of the times students of this college get top positions in exams held under the national university. A student named Abdul Mazid was awarded gold medal from this college for his outstanding result. Five students got distinction from this college when Radha Govinda was the Principal. There are three halls for the students of the college of which two are for male and one is for female students. Students of this college face acute accommodation problem. Only three halls are not sufficient for about 1500 students. As a result, most of the students have to stay in rented rooms in town at a very high cost. There are six buses for the students of which one bus is run with Govt. fund and rest five buses are run with college fund. There is also a microbus for the teachers. The number of transport needs to be increased to meet the growing demand. A computer Laboratory is going to be built to increase the technological knowledge of the students. The Govt. has offered some financial support for this purpose. Comilla Victoria College has a library where 9 daily newspapers are kept and there are about 2100 academic books. But no magazines and journals are subscribed. In this regard Assistant Librarian Md. Rezaul Karim Bhuiyan said that there is lack of sufficient space in the library. But students and teachers feel that more academic books should be acquired and more manpower should be appointed. Students of the college regularly take part in debate. They won many prizes from BTV and others debate competitions. Bangladesh National Cadet Core (BNCC), Rover Scouts are also working at the college. Sandani and Badhon regularly organise blood donation programmes on the campus where students and teachers participate voluntarily. Different cultural programmes are also organized on various occasions. Victoria College Chhatra Sangshad played a vital role during the 1952 language movement and1962 movement against Ayub Khan. It was also actively involved in the Liberation War of 1971. At least 334 students participated in the war of whom 35 sacrificed their lives for the noble cause. Major Rafiqul Islam, Saheed Khaza Nizam uddin got the recognition of "Bir Uttam" and Lieutenant Col. Akbar Hossain, Saheed Abdul Momin got “Bir Protik” respectively who were the students of this college. Advocate Abdul Matin Khosru, Prof. Ali Asraf, AHM Mostafa Kamal (Lotus Kamal), AKM Baha Uddin Baher also participated in the war, were students of this college. Renowned TV presenter Hanif Sangket (Ittady), Famous journalist ABM Musa, Whip of the national Sangshad and Lawmaker Md. Mujibul Haque,Bangladesh Cricket Board(BCB) chairman AHM Mostafa Kamal(Lotus Kamal),Scientist Abdul Jalil, Head of UNICEF of Dhaka unit Mahera Khatun, journalist Gaziur Rahman, Lawmaker Advocate Abdul Matin, Hazi Baher and many other renowned persons were the students of this college. The teachers and students of this college contribute to funds for people affected by natural calamities like flood, cyclone, tides so on. Former student of the college AHM Mostafa Kamal(Lotus Kamal)who is the chairman of Bangladesh Cricket Board(BCB) and also chairman of finance committee of the present govt. said that Comilla Victoria College is one of the renowned colleges under national university. He was very proud to be a student of this college, who contributed a lot for the development of the college. Another former student of this college Anisur Rahman Mithu who is the Chhatra League Secretary of Comilla District said that when he was a student of this college the overall situation was very good. But he feels there are some limitations at the moment which should be solved by the govt. immediately. Two student of this college, Md. Badiul Alam and Md. Mafizul Islam who are second year students of Accounting Department said that they feel proud to be studying in a renowned college like Victoria. The teachers of this college were very dutiful and sincere to students they commented. They however feel that the accommodation and transport problems of this college should be solved soon. Victioria college has a plan to open several new departments including Finance and Marketing .The authorities have already taken initiatives in this regard. They also want to build more halls for solving accommodation problem with financial support from the Govt. "Our students always get the highest position in Comilla Board"
Prof.Md.Abdul Matin is the 43th principal of the Comilla Victoria Govt. College. He shares his views with Star Campus on the various issues of the college. The interview was taken by Md. Kamruzzaman Bhuiyan. Star Campus: What's your evaluation of the college? Prof.Md.Abdul Matin: Comilla Victoria College has become intricately linked with the history of Bangladesh itself. It is one of the best colleges not only in Comilla but also in Bangladesh. I recall the crucial role played by the teachers and students of Comilla Victoria College during the Language Movement, the Liberation War and others historic national movements. S.C: What's your evaluation of the results of the college? Prof. Matin: The results of the students of this college are quite good. Students always get the highest position in Comilla Board on the basis of good result in HSC. Students in the honors section also cut a very good figure under the national University. Nevertheless, the college has also some limitations which should be solved immediately. S.C: What kinds of limitations do you mean? Prof. Matin: There is a crisis of teachers in the college. There are only three to fours teachers in most of the departments and they have to take classes in both the two sections. For example, in Statistics, Mathematics, Zoolozy, Islamic History, Philosophy and Arabic departments there are only four to five posts which is insufficient. S.C: Do you think that there is also accommodation and transport crisis? Prof. Matin: Definitely. Students face acute accommodation and transport problems though we have enough space for constructing more halls. S.C: Do you have any expectations from the Government? Prof. Matin: I strongly believe that the Govt. will build more halls, appoint more teachers and will provide transport facilities for the betterment of the college.